Are you proud of that last name of yours? All I did was cut out a piece of background fabric that was slightly bigger than the mat that was inside the frame. Then, I printed off the letter ‘J’ in the font that I liked from the computer. Then I cut out the ‘J’ in a coordinating fabric. Lastly, I used double sided fusible web to attach the letter to the background fabric. Then I folded the fabric around the mat, glued it in place, inserted it into the frame and……..done. « Sponsor and GIVEAWAY time again!! I saw a super cute idea for displaying names in your kids room…it was off the hgtv website and they took particle board and covered it with a cordinating color of fabric for the room and then painted the letters you buy at micheals for 1.99 and put them on top of the particle board…it was super cute and not many people look on that site so I thought you could share the idea since you are fixing your little boys room and that would be perfect in there… I will email you the picture right now! tell me what you think! I need something cute to go above where our keys hang. I think this is it! Thanks! How did you find a font that big for the "J"? Is there a special large font place? Ooooh, letters for everyone would be really cool too. Thanks. Oh, and I just made the font large in Word……like 200 or something. You can make your font as big as you'd like, print it out, and then cut around it. Hope that helps. hmmm, I really like this idea! love it, great way to personalize a room, thanks! You can save a lot on printer ink if you choose the option to "outline" under the font editing. It outlines the letter, instead of filling it all in. The paper also lays flatter, because it doesn't have all that heavy ink trying to make the paper curl in on itself. I enjoy getting great ideas from your blog! Great tip Sherie….I had no idea. Thank you!! How about cutting whole words out…like maybe BEACH, and then making color copies of vacaction photos to glue on the letters…you would need to use a "fat-lettered" font…you could do it for BASEBALL, FOOTBALL, PROM, lots of things! Adorable! I did a similar one but with paper and a silhouette. Love your blog. I am a follower now! These are so cute. Wish my last name didn't start with an "O". Just kinda' looks funny in the frame. 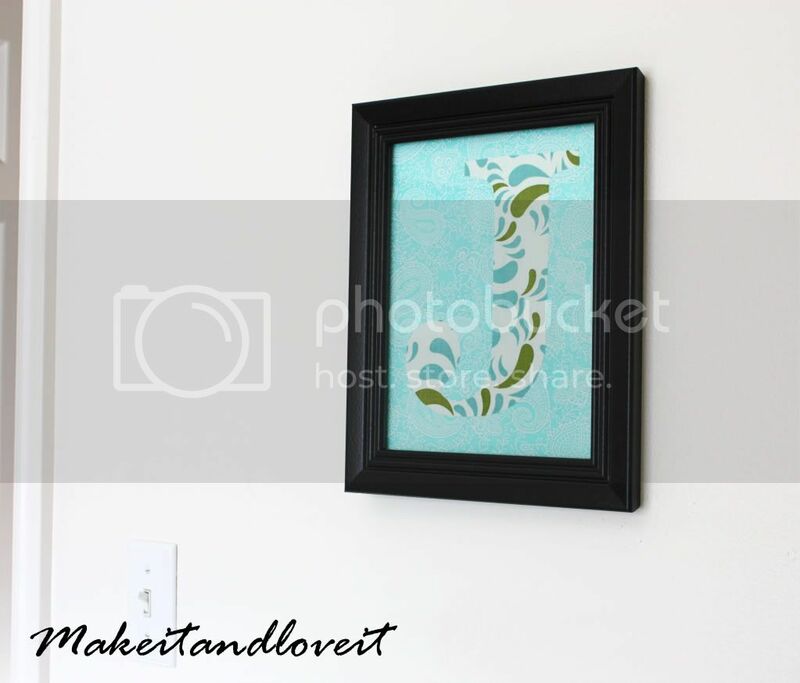 Maybe my first initial and hung in my craft room. Soooo neat! I am going to do these for all of my kids. :) Thanks! I really like your fabric choices. And come to think of it, I AM proud of my last name! Just found your blog and I'm snooping around getting some great ideas! I love this one, but I'm wondering how you keep the edges from fraying? Thank you so much Ashley! My cousin and his fiance/wife are having a reception this Saturday and I have been searching for an inexpensive but still cute gift for them- this is PERFECTION! I found your blog today and I am in love! I do have a dumb question though (I am new to working with fabric) – how do you get the letter cut out – I mean do you pin the paper letter to the fabric and cut around, do you seal it to it somehow and cut around? Shannon…..nope, not a dumb question. I remember when I posted about this so long ago, that it was just a quick project and I only quickly shared how to put it together. Sorry for the non-specifics. But, I think I just cut out the paper "J", then traced that onto the fabric with a pencil, then cut it out. Then I cut out some fusible web in the same "J" shape (like this stuff: http://www.amazon.com/Thermoweb-Heatn-Bond-Iron–Adhesive-17/dp/B001145BDU/ref=sr_1_7?ie=UTF8&qid=1298735765&sr=8-7) and then placed that between the letter and the background and ironed the layers together. I didn't stitch around it because I knew once it was in the frame, it would get moved around or fray at all. But you could stitch around it for a cool design/affect. It's totally up to you. What a phenomenal idea!!! Great! Great! Please keep the ideas coming. I sure need the help. Another great little, do-able project. …. if you would like to take a look. Thanks for taking the time to post it up! I did this for my sister for Christmas. She loved it!! Find more great DIY handmade and personalized gift ideas for family, friends, and neighbors on House of Ideas.